NEW YORK - Rick Porcello grew up in northern New Jersey and graduated from Seton Hall Prep, so he'll have a lot of friends and family watching what will be, for many of them, a bittersweet Game 4 of the American League Division Series. "I learned how to say no, so there's not that many people coming," Porcello laughed on Monday, "but a lot of friends that are envious of the position I'm in right now. I get the opportunity to pitch against the Yankees in the postseason. With the seasons that we've both had and the energy between us, it's been exciting playing these guys this year." When he does go out there, Porcello knows the stakes. The Red Sox hold a two games to one lead in the ALDS, and could end the Bombers' season tonight on their own field. It's the opportunity of a lifetime for a Boston pitcher, but just so happens to be one Porcello is getting on his own form of "home turf." "I couldn't think of a better spot to be in as a big leaguer getting the opportunity to have the ball for Game 4 in Yankee Stadium. That's what it's all about," he said. "This is the culmination of the entire season, so I'm definitely looking forward to that and giving us a chance to win." Ancient history says Porcello, like most of the Red Sox starters, does not have a strong postseason track record. Recent history, though, says that the righty threw a complete game one-hit shutout against the Yankees on August 3, and threw seven innings of two-hit shutout ball on April 12. Both of those starts were at Fenway Park, but after Boston seemed to rather easily conquer the Yankee Stadium postseason mystique last night, tonight turns into just another game for Porcello. "I think the postseason's more about channeling yourself," he said. "Your adrenaline, your blood pressure, everything's kind of pumping, so you need to be able to take a step back, take a deep breath, and execute pitches the way you know how. To me, that's the most important thing." He of course watched how Nathan Eovaldi dominated the Yankees for seven innings last night, and surely picked Eovaldi's brain about the outing, but with this being the 23rd game between the Yankees and Red Sox this season, there's quite a bit of data that one outing really might not change. "We play these guys a lot during the course of the season. There's a familiarity there that you know what you have to do, it's just a matter of going out there and doing it," Porcello said. "They're not doing anything that we haven't seen them do the entire course of the season. It's just for me, kind of staying in my own mind of trying to stay locked in and execute the pitches I need to execute." And so, his game plan remains the same as it was the first two times he faced the Bombers. "I just think attacking their hitters and being aggressive, that's the biggest thing," he said. "These guys are very good hitters, they're very well coached and have a solid approach. If you fall behind guys, you give them the opportunity to see pitches in the strike zone. That's the only way you can get back into the count because they're disciplined and they don't chase a lot." Porcello has kind of had an extra day to think about everything, as he was originally scheduled to start Game 3 but was switched to Game 4 by Red Sox manager Alex Cora on Sunday. That was in part, Cora said, because of the need to use Porcello in relief in Game 1, but the righty won't be phased by that quick cameo four nights ago. "Especially in the short series, you got to be ready for anything. 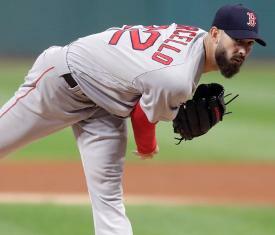 I was prepared to pitch Game 1, and ready to pitch Game 4 now," Porcello said. "In Detroit, I started postseason games, but I also came out of the bullpen, and I think that helped me a little bit with my preparation and just understanding different mindsets as a starter to come out of the 'pen." A simple mentality, one you hear often during NCAA March Madness: survive and advance. "Just seeing what transpires, especially in a short series in five games, each game is essential," he said. "It's not a full seven-game set, so you've got to do whatever you can. If you have the lead that night, you've got to do whatever you can to win, and if that means starting pitchers pitching, that's what it means. I saw that in Detroit a little bit." The Red Sox will certainly hope that Porcello follows in Eovaldi's footsteps, in length and/or in performance. For if he does, and the Red Sox survive, then the next time they return home to Boston, it won't be for a deciding Game 5 against the Yankees, but for an advance to the ALCS, against the same Houston Astros that ended their postseason in last year's ALDS. "The only thing we know is that if we don't win (Game 4), we have a Game 5," Cora said after Game 3. "But we've got a chance to come here and play a good game, and see what happens. I know they trust CC. We trust Rick. Veteran guys, they've done it for a few years. It should be fun."